Filled with apples and apple blossoms, this "Apple Tree" tapestry by Gustav Klimt, is based on his work "Apfelbaum" or Apple Tree from around 1912. It is often considered a work that could represent the tree of life, as the florid blossoms and fruit in the height of summer is a remarkable sight to behold. Here we see a burst of color and texture that is more impressionistic that Klimt's other works, and represents his landscapes period of painting, which occurred immediately following his sensuous symbolist theme of painting such as The Kiss, or Water Serpents I and II. The apple tree is accompanied by a row of flowers in the field in the foreground to give an impression of the endless bounty of nature in this imaginary garden of Klimt's piece here. 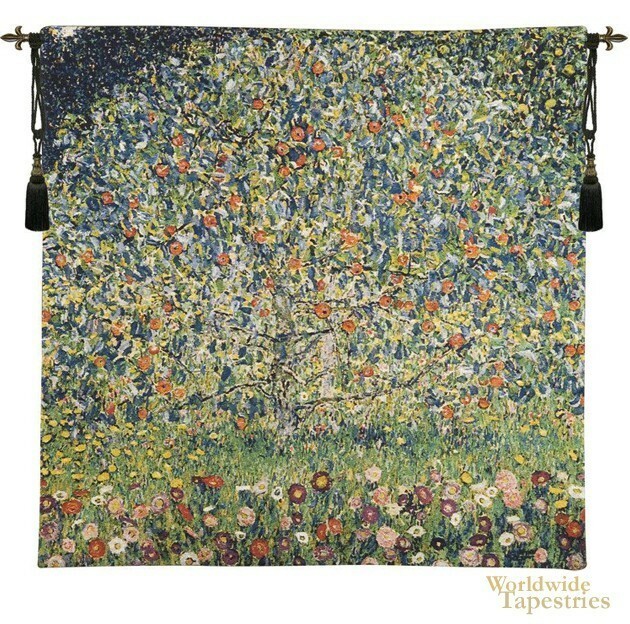 This modern tapestry "Apple Tree - Klimt" is backed with a lining and has a tunnel for easy hanging. Note: tapestry rod and tassels, where pictured, are purchased separately. Dimensions: W 39" x H 39"
Dimensions: W 66" x H 66"